There are clear, significant health advantages of eating breakfast. Having this meal is more important than when you eat it. If your mornings are flexible and you have control over when you sit down to the table, though, it may be worthwhile to eat your food as soon as you wake up. Even if you wait a while to eat breakfast after you wake up, you’re still doing your body a favor. A daily breakfast helps curb your hunger later in the day, reduces your risk of obesity, encourages you to make healthier choices and gives you more energy for physical activity and exercise. 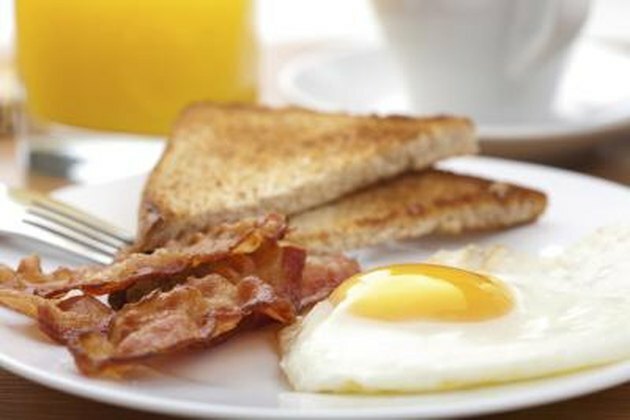 “Eating Well” nutritionist Brierley Wright, M.S., R.D., also points out that breakfast eaters tend to have lower cholesterol levels and are able to obtain more healthy essential nutrients such as fiber, calcium, zinc and iron. Breakfast jump-starts your metabolism in the morning, so eating soon after you wake up can raise your energy level right away and encourage you to be more active throughout the morning and into the afternoon. Your blood sugar levels are naturally low when you wake, so eating within about 60 minutes of getting up can help prevent a complete blood sugar crash. If you wait until almost lunchtime to eat, however, your energy may be dragging and you could end up overeating during the first meal of the day, explains Florida International University. Not everyone feels ravenous when they wake up in the morning. If you have no desire to eat right after you get up, shoveling in a meal may make you feel uncomfortable, so Wright says it’s fine to wait for a while before you have breakfast. “Eating breakfast doesn’t have to be the first thing you do each day,” she notes. “Just make sure that when you do eat, your meal is something that will sustain you for a few hours.” For a high-energy meal, “Cooking Light” dietitian Holley Johnson Grainger, M.S., R.D., recommends choosing foods that offer healthy fat, lean protein and complex carbs, such as string cheese with whole grain crackers or nut butter and a whole wheat English muffin. If you work out in the morning, it’s important to give your body enough time to digest food before you hit the gym. Eat a healthy, balanced breakfast at least an hour or two before your workout -- exercising any sooner than that could cause digestive discomfort or an upset stomach. You can also eat breakfast after an early workout, but it helps to have a snack or energy drink before the exercise.